After a few warm days a little cold snap seems mighty cold. In a couple of months people will be complaining about the heat and so it goes. The only constant is change. Walnuts are some of the last trees to leaf out, so the mystery of the colossal stump will linger. It may be sprouted out before the brush is cleaned up. Meanwhile, the bees seem to be doing well and everyone is pleased about that. George Bailey would say something to the effect, “What service does the honey bee! Wild or domestic, bees do most of the pollinating (living and dying) around here, Mr. Potter. Well, is it too much to ask that they do their pollinating (living and dying) in a poison free environment?” That conversation did not occur, but the question is a valid one. Honeybees, wild and domestic, are losing ground with various agricultural chemicals and insecticides across the nation. Champions are grateful for the ‘wild bunch’ living in the enormous stump on the South side of the Square. It is a gift to live in a part of the world that enjoys wild pollinators, bear, and eagles, as well as the annoying ticks and chiggers, without which this country would surely be overrun with tourists. Elmer’s little black hen toured Champion last week. She had found a nice spot to lay her eggs in his Kubota RTV and happened to be engaged in that activity when Elmer made his trip over to Henson’s Downtown G & G. When they arrived the hen got out and took a stroll around the Square. Elmer gave the two eggs to the storekeeper. The little chicken is not accustomed to being around people so as more joined in the round-up effort, she became more elusive. After a while they gave up and the banty spent the day exploring and grazing, scratching around the periphery of the Square. She found water and generally made herself at home until Elmer came back the next day. She must have been ready to go because she resumed her place in the Kubota when Elmer went in the store. Frances raised the hen and was likely glad to see her back in her own yard. Frances and Elmer have been enjoying the Thursday night pot-luck bluegrass jam over at the Vanzant Community Building. Supper is served at six and then the music starts. Elmer said the previous week there had been about fifty people there in addition to the musicians. He was most impressed by a couple from Canada who have joined the musician’s circle. Now that the weather has moderated, perhaps the music lovers will come out for the fun. Laine Sutherland has been doing a good job of keeping the internet full of references to the 32nd Annual Fiddlers Convention at the North Arkansas College in Harrison. 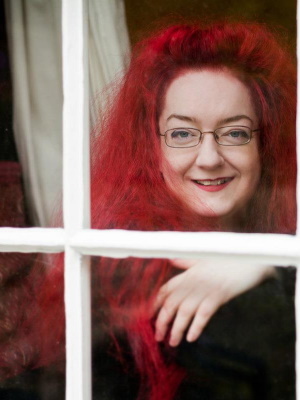 She posts some nice tunes featuring Alvie Dooms, Bill Conley, John White, James Ruth, JR Johnston, and Rachel Reynolds Luster. There was a great piece by Tim Daniels on a 5 string fiddle, Kathleen Gustafson on mandolin and Dave Gustafson on guitar. The song was Have You Met Miss Jones? Without a single word being sung, the music makes a person very much want to meet Miss Jones. A Champion friend from over in Jordan, MO is spending a few days up in Old Jeff (Jefferson City) doing what he can to help expand Medicaid in Missouri. As it is, the ‘gap’ insures that if a person of modest means (a family of 3 making over $3,600.00 per year) has a serious accident or illness, he can expect that his medical treatment will bring him to bankruptcy and possibly homelessness. In this generally low income area with an aging population, it might be surprising who all would genuinely benefit by the expansion of Medicaid. The benefits would not only improve the quality of life for folks in marginal financial circumstances but could help restore some of the small hospitals and provide jobs for people in the health care industry. It will bring two billion tax dollars back into the State. Folks down in Arkansas have had good luck with it, and while Missouri is not generally the first in line to follow Arkansas’ lead, in this instance it might well be prudent. 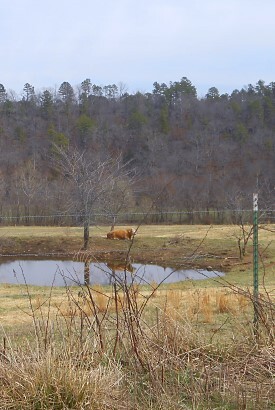 A pastoral scene near downtown Champion. Fourth grade student Jhonn Rhodes has his birthday on April 1st. That probably has made for some interesting birthday parties over the years and will for years to come. Happy Birthday, Jhonn! Lannie Hinote reported that the Skyline archers had a wonderful showing for their school at the State Archery Tournament that was held at the Tan-Tar-A Resort at the Lake of the Ozarks. They competed with 86 other schools and 1,400 archers. Morgan Whitacre, Levi Hicks, Gavin Sartor, and Dylan Ford competed for Skyline and local high school archers were Tristen Shearer and Lukas Brown. This excellent archery program is a feather in the cap of this wonderful little rural school. The Douglas County Health Department will be at Skyline on Tuesday, April 7th. They do blood pressure checks and a variety of other health screenings free for the community from 8:00 to 10:00 a.m. It is a good example of the school supporting the community and the community supporting the school. Champion! It is a lucky individual who gets a chance to correct her mistakes. Last week the favorite meteorologist of the Skyline Area Volunteer Fire Department was misnamed as Amy Dyer. The lady’s name is Abby Dyer. Apologies are extended to Ms. Dyer herself, to the whole Skyline VFD and to certain firefighters in particular. If she reads The Champion News, she knows what a fan club she has in central Douglas County. Esther Wrinkles used to write the items from Champion and later from Vanzant. She wrote for the better part of fifty years and once in a conversation with her it was said that sometimes making a mistake is a way to revisit a subject in a future article. Her friends miss Esther and wonder what she would have to say about the tallest stump in town. Notes from Hunter Creek also had some corrections this week, but mostly it was full of good information about morel mushrooms and neighborhood snakes. Everyone will soon be on the lookout for May apples and the bragging will begin. The Cowboy will probably find the first and the most, but he only shares with certain people. The whole idea of exclusivity is that some, by the very definition of the word, are excluded. There is no use in having your feelings hurt about it. Just go find your own mushrooms and figure that if you brag about it too much someone will dog your heels until they find your patch and then you will be sorry. Bon appetite! Linda’s Almanac from over at The Plant Place says that the third will be a good day for planting above ground crops and the fourth through the seventh will be good for root crops. These will also be good days to transplant. Linda is open for business now with her pretty broccoli and other cole crops and lettuce. It is the plan of a number of old folks to get a lot accomplished in the garden without wearing themselves out completely. Send your garden plans and maps to your mushroom patches to champion@championnews.us or to The Champion News, Rt. 72 Box 367, Norwood, MO 65717. Find the almanac on the bulletin board in the meeting room at the Recreation of the Historic Emporium, up at The Plant Place in Norwood and at www.championnews.us. The www stands for wide, wild and wooly in Champion—Looking on the Bright Side! A few warm, sunny days in a row has lifted the spirits of many an old Champion and some of them are stiff and sore from overexertion after being comfortable around the fire all winter. Others have farm chores that they get out and do every morning, up and out of the house by seven. They are feeding cattle, checking fences, looking after their agrarian responsibilities, day in and day out, no matter what the weather. In addition to wholesome food, they provide an excellent example for good living and they are probably not stiff and sore and surely not sunburned. Elizabeth Mastrangelo Brown was 23 in 2013. She is a little older now, having had her birthday on the 16th. The poet, Billy Collins was born on March 22, 1941. He said, “A sentence starts out like a lone traveler heading into a blizzard at midnight, tilting into the wind, one arm shielding his face, the tails of his thin coat flapping behind him.” The 23rd belongs to the local Maytag repair man, to Elva Upshaw Brott, still a smiling bride, and to Judie Pennington who says, “Two nights in a row of 55 degrees, and some sun and Wow! Mushrooms! Generally around tax time.” Because her friend does not really know if Judie’s birthday is in February or March, she gets celebrated twice every year. 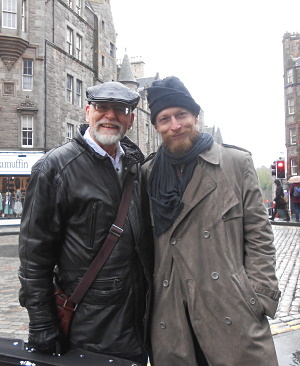 A lovely gentleman in Edinburgh, Mr. Gordon Reynolds, also celebrates on the 23rd. He is an excellent musician and the go-to guy if you are looking for real bluegrass music in that fair city. Troy Powell had a wonderful smile and a great appreciation of bluegrass and gospel music. He was born on March 26, 1926, and passed away on his birthday in 2001. Jasmine Baker is in the third grade at Skyline School. Her birthday is the 27th. She shares the day with school bus driver, Mr. Ted. Joseph Fulk is a kindergarten student who celebrates the 28th, and seventh grader, Gavin Sartor, celebrates the 29th. Ewan McGregor and Christopher Walken, movie actors, Cesar Chaves, Al Gore, and Barney Frank, political activists, Rene Descartes, philosopher, and composer, Joseph Haydn, all share their birthday with Edinburgh’s charming artist, Morag Edward, on March 31st. That is quite a pool of talent across many disciplines. Among the many subjects covered in the Wednesday Champion Chat was the number of grease rack bridges in the area. 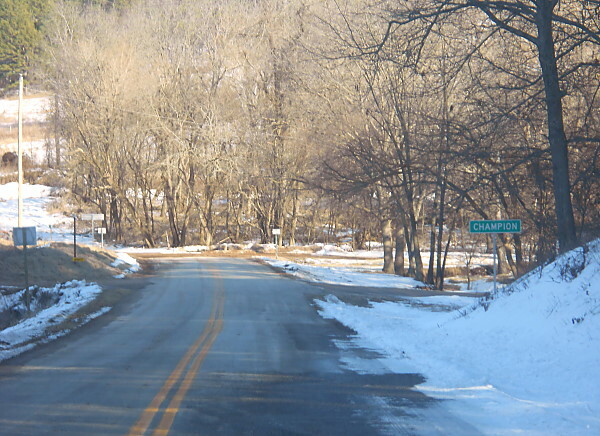 Mr. Ray says they are also called stringers and steel ‘railins.’ Bob Leach drove a big truck (maybe he said a feed truck) over a high grease rack bridge across the Gasconade. Ray had an adventure across one closer to the water and one of the Mr. Stones said there is a bridge made of white oak logs across a branch around here somewhere. It might be a savings of materials to have an open place down the middle of the bridge, but it might pose an engineering problem, and certainly a pedestrian might be challenged. A newcomer to the discussion heard a regular say that he had been going someplace down in Arkansas for twenty-three years running. Later on, the newcomer asked, “What were they running. Was it horses or was it dogs? “ By the time he spends a few hours around those tables, the new Champion will know that ‘running,’ in this instance, means ‘consecutive years.’ He will be hearing all manner of things at the table as well as in the great outdoors in his new neighborhood. Sound echoes and amplifies through the hills and hollers. A conversation, clear as a bell, might drift into the back yard clothes line from down the road, across a horse pasture, and on the other side of a hill. That chainsaw running might sound like the front yard trees are being harvested when “Timber!” is being shouted on the other side of the mountain. The wonders of this beautiful part of the world include starry nights with no light pollution and a welcoming community. Champion! According to Linda’s Almanac from up at The Plant Place in Norwood, the 27th and 28th will be the best days to plant above ground crops. Ron, the weatherman and the lovely Amy Dyer, say a cold front will be moving in about that time. Champions will just take what comes and make the best of it. People living in low lying areas with early crops in already will have to devise ways to cover them against a hard frost. The almanac is up on the bulletin board by the back door in the meeting room at the Recreation of the Historic Emporium on the North Side of the Square in Downtown Champion. Come add your wisdom to the conversation and share your garden lore. Pete Seeger says, “Inch by inch, row by row, gonna make this garden grow. Please bless these seeds I sow, ‘til the rain comes tumbling down” in Champion—Looking on the Bright Side! “It was one of those March days when the sun shines hot and the wind blows cold: when it is summer in the light, and winter in the shade.” Charles Dickens said those and several pounds of other interesting words. These fit Champion well just now as sighs of relief add to the breezes and winter’s woes are being replaced by greening things and daffodils. There may be more winter ahead even after Spring officially arrives, still the collective feeling is one of reprieve. Passersby on a Wednesday morning trip to Ava saw Wayne and Joann Anderson sitting out on the back porch of the old house, the morning porch, watching the fog burn off the countryside stretched out there before them. It was a peaceful scene that might have been captured in a painting or at least on film, but the prospect of disturbing such sweet reverie to preserve it seemed counterintuitive. It looked like a private moment. 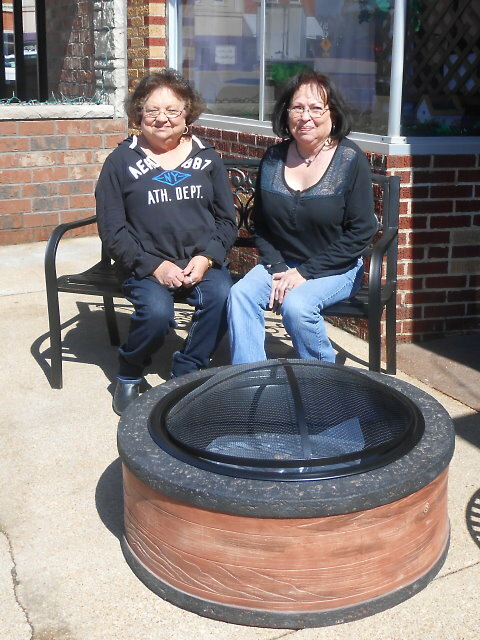 Sisters, Linda Keys and Marjorie Carter, enjoy the sunny side of the street on the garden bench that Marjorie won in the drawing at the Skyline VFD Auxiliary Chili Supper on Saturday, March 7th. Included in the prize was the 42 inch cast stone fire pit. Ms. Carter has owned and operated Downtown Pawn on the square in Mountain Grove for twenty years and has been a regular benefactor of the various rural fire departments in the area. She says this is the first thing she has ever won and that she and her family will really enjoy it in her back yard this summer. The Skyline Auxiliary is appreciative of her support over the years and is pleased that her generosity has come back to her. Marjorie Carter at Downtown Pawn in Mt. Grove was pleasantly surprised to learn that she had won the drawing for the ornate garden bench and the cast stone fire pit at the Skyline VFD Auxiliary Chili Supper last Saturday. It was delivered to her Wednesday afternoon and she and her sister, Linda Keys, took a moment to have their picture taken on the sunny sidewalk. Ms. Carter has been a loyal supporter of the Skyline VFD for years and it is nice to see her generosity coming back to her. She was not present for the win, but she won anyway. Champion! Tim and Jean Scrivner were at the chili supper. Tim contributed another of his remarkable bird feeders to the silent auction. Jean said that her brother, Charlie Burlile, up in Boston has had some adventures during the long, cold winter. The forecast ahead for them this week is highs in the 40s and lows in the 20s. They will have snow on the ground for a while yet. 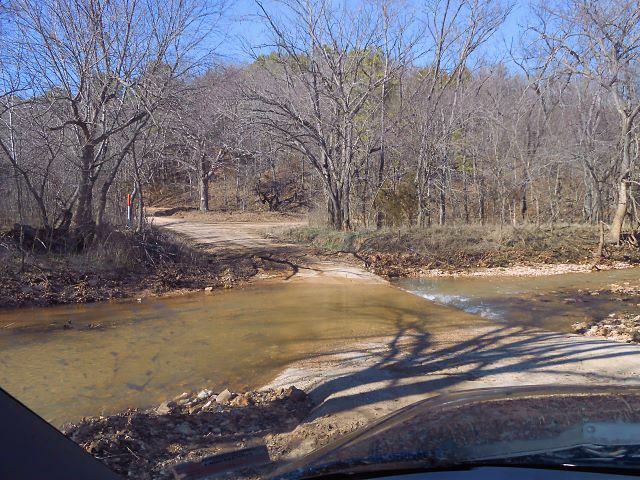 Around here, the mud has begun to settle in most places and hardly anyone is complaining. Soon it will be time for Cowboy Jack’s annual dampening. A voice piped up from the round table last Wednesday to say he almost drowned a good horse the last time. The round table is where the prevaricators sit. They cannot be backed into a corner that way. Fortunately Almartha’s bard was out on the porch (supposedly helping to load the heavy fire pit into the truck, but mostly just creating confusion) when he finally let his misogynism all the way out with a snide remark about women drivers. One of the ways these radicals go about instigating trouble is to push and push until the forbearance of the maligned wears thin and she retorts, “Aw, shut up.” Then he chuckles and grins real big, “You’ve been wanting to say that for a long time, haven’t you?” He won. His sister seems to be trouncing him regularly at Scrabble, so he goes off to the next county to cause trouble. His friends are still glad to see him coming, Bob and Ethel among them. They reported having seen quite a few deer the other day, a couple of big bunches. They are still enjoying the eagles up at the headwaters of Fox Creek. The other day Bob said if he lived closer he would come to Champion every day. Bluebirds and robins and geese flying north all tell us Spring is near. Come down to the wide, wild and wooly banks of Old Fox Creek and share your ideas about what makes you know it is Spring. Remember that song from “State Fair?” “I’m as busy as a spider spinning daydreams; I’m as giddy as a baby on a swing. I haven’t seen a crocus or a rosebud or a robin on the wing. But I feel so gay, in a melancholy way, that it might as well be spring. It might as well be spring” in Champion—Looking on the Bright Side! 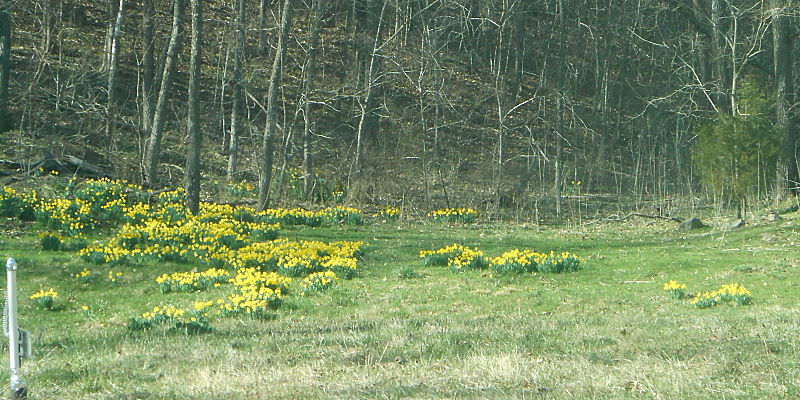 Snow has morphed to mud and daffodils are emerging as a harbinger of spring. Flocks of folks were out Saturday night at the Skyline VFD Chili Supper enjoying a chance to socialize after long periods of being shut in. The dinner was tasty, wholesome, home-made food produced and served by some hardworking ladies and the pie table was a delight to see. Among the top items at the silent auction was a window from the Old Champion Store. Someone will have a piece of history to hang on a wall. Steve Moody called that morning, whispering through his laryngitis that he did not think he could MC after all. On very short notice, Van Kelley stepped up and did an excellent job. He is accustomed to public speaking. Whetstone kicked off the evening with their usual flair. It is clear that they like what they are doing and it is contagious. After a kind person used a chain to pull the Lead Hill Players out of the mud, this trio from Mansfield provided a great set. They have an eclectic repertory. Next year they will know where to park. Backyard Bluegrass closed out the evening with their great sound. The band is bigger than it has been at various times in the past and, as always, they really ‘bring it home.’ When the last guests had left, Skyline firefighters and Auxiliary members went about restoring the school to its good condition, ready to receive those little learners on Monday morning. Once again, it was a successful event benefiting the Skyline VFD which benefits the community in many ways. Thanks to all who attended and to those who worked so hard to make it happen. The snow and ice, rain and mud has not kept regulars away from the meeting room of the Historic Emporium over on the North Side of the Square in Downtown Champion. Lee Ray dodged snowflakes Wednesday to propagate his image in the Village as the Wise One. His prophesy of another big snow at the end of the month has caused him to slide precipitously down the popularity scale and he will have to do some slick talking to redeem himself. He is probably up for it. They hardly come any slicker. He will likely be on probation until the time of the prophesy has passed and his good standing will stand in the balance. Standing dead on a sunny southern slope is a favorite kind of firewood, especially stacked neatly in the wood shed. Any number have vowed to be better prepared for next winter with more firewood, more food in the larder, and more projects to fend off the doldrums. They will have a new set of strings for their instruments and will work up old favorites like, “Grab your coat and get your hat. Leave your worries on the doorstep. Life can be so sweet on the sunny side of the street. If I never had a cent, I’d be rich as Rockefeller with gold dust at my feet on the sunny side of the street” in Champion—Looking on the Bright Side! Those nature lovers who are excited about the sight of a full moon on a clean white snow will have this week to revel. After that Ron Hurst has said Thursday will be the last day of hard winter. Esther Wrinkles said, “Thunder in February, frost in May!” That may be misremembered and might really be “for every time it thunders in February it will frost in May.” A check in with Irene Dooms verifies that memory served correctly this time. She did not remember the ‘every time’ part either. She is looking forward to the weather breaking and being able to get out and about more. Her Champion friends are looking forward to seeing her in the neighborhood again soon. Terry Ryan’s husband saw a flock of geese flying south on Sunday. Terry says she does not think that is a good sign. Whatever the signs and whatever happens, stalwart Champions are up for it. Spring is on its way. Brenda Coffman Massey wrote a thank you on facebook for all those who were able to come out to the Vanzant Community Building in the bad weather last Saturday night to the benefit pie supper for Beverly Emory. Bev kept Esther’s elaborate hair-do looking perfect for years and kept the place sunny with her own sweet smile. Steve Moody furnished smoked meat for the dinner and JD Shannon, Dennis Lynch, Debbi and Joe Shannon, Debbie Stone, and others were thanked for doing all the hard work of organizing the evening. Whetstone provided the entertainment. It is great to know that the neighborhood will step up to help a friend and neighbor. Steve Moody is a good neighbor. He will be doing the Master of Ceremonies work at the Skyline VFD Auxiliary Chili Supper this Saturday. Whetstone will be playing there too, along with Backyard Bluegrass and Lead Hill Players. The roads ought to be good enough and whether or not there is snow on the ground or mud, the yearning for a good get together will have the community ready to venture out for some real fun and the chance to see old friends, meet new ones and support the great volunteer fire department that serves the area so well. All the proceeds from the chili supper go to buy fire-fighting equipment and training for those wonderful volunteers. Local kitchens will be warming up on the last really cold days of the winter as pies of all kinds are being baked to help the cause–pumpkin, peach, apple, strawberry/blueberry and lemon meringue—just to name a few. Maybe someone will use Esther’s coconut cream pie recipe this year and have us all remembering her dedication to the fire department from its very beginning. Then, of course, the blackberry cobblers will be the favorite temptation for dieters abandoning their resolve for one glorious evening. Regular Wednesday visitors to Champion start showing up in the late morning and the Meeting Room at the Historic Emporium fills up with history, tall tales, jokes, speculations, conjectures and observations. Ethel Leach has been watching bald eagles. There is a mated pair that lives up her way and she gets to see them often. She and Bob had lost a calf not long ago and found a golden eagle at the carcass. They are enormous birds. Ethel said the golden eagle chased a bald eagle away from carrion. People with livestock have no choice but to be out in the elements tending their flocks and herds. Farmers have chosen a hard way to make a living. Gardeners who just sit inside watching their plot through the window as the snow ‘fixes’ nitrogen for them understand hard work, but the relentlessness of exertion required of a dairy farmer is something milk drinkers everywhere should appreciate. When you wipe that white mustache off your upper lip you can thank a Champion dairy farmer. Irene reminds us that your newspaper is in your mail box because a mail carrier put it there—another occupation known for its unremitting ceaselessness. Champions all! A friend over on Hunter Creek says, “Now get up and go enjoy the beautiful outdoors!” Some will linger by the fire for a while first, but will get out by and by, if just to go get the mail. “A life is like a garden. Perfect moments can be had, but not preserved, except in memory.” That was a reflection of Leonard Nimoy before he passed away recently. Back before he was Mr. Spock he was frequently on Bonanza, Gun Smoke, Wagon Train, The Virginian, and Rawhide, as well as in a number of ‘cowboy’ movies. He shared the screens with many legends and in the process of make-believe they propagated what is considered to be a wholesome set of standards for living–among them honor, compassion, and justice. Many who have grown up watching television may have these stories confused in their minds with history. There is currently a movement in Oklahoma and Texas and probably other places, to cease teaching ‘advanced placement’ history in the public schools because it may paint an unflattering picture of our past. A friend said, “Just because you like what you hear does not mean it is the truth.” We honor our forbearers by teaching all of U.S. history, even the parts that might be uncomfortable, unflattering, shameful and unpatriotic. The knowledge will help us be better people and better citizens of the world. America has been at war for 222 out of the 239 years since 1776. It looks like there is plenty yet to learn. Among good citizens count Barbara Deegan. She founded the Ozark String Project back in 2007 and now has over 40 students. They are being trained to read music and to play by ear in the local tradition of fiddling. Learn more about the Ozark String Project at their concert on Sunday the 8th at the Performing Arts Center in Ava at 3 in the afternoon. It will be a short program presented by teachers and a number of students who have auditioned for the opportunity to perform. Barbara’s contact information is bdeegan@avabears.net or 417-683-5450 extension 136. The Arkansas Traveler, Soldiers’ Joy, Red Haired Boy, Down Yonder, Cherokee Shuffle, and Esther’s favorite, Orange Blossom Special, will be some of the hundreds of fiddle tunes that these young folks will likely be saving for posterity. History via music is a Champion notion. Come down to the wild, wooly banks of Old Fox Creek and sit in on the conversation around the stove on Wednesday or any day. Feed your hunger for knowledge, ice cream or candy bars, and while you are at it pick up some feed for your dog, your cat, or your calf. If you need fencing staples, a new flush valve for your toilet, pie pans (for your chili supper contribution), or pizza you will have come to the right place. If you have or need an optimistic world view and a happy heart, you will be welcome in Champion—Looking on the Bright Side!